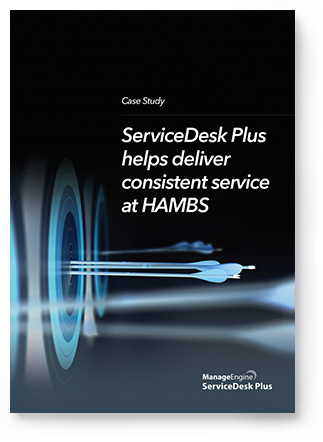 Consistency across IT environment, proactive monitoring, and efficient reporting were the major hurdles that slowed HAMBS from improving their IT service delivery process. Read this story of how ServiceDesk Plus helped them address all these hurdles, and achieve IT service delivery excellence. ServiceDesk Plus is an ITIL ready IT help desk software for organizations of all sizes. Over 100,000 organizations across 186 countries trust ServiceDesk Plus to optimize IT service desk performance and achieve high user satisfaction.